Here are the results of 2 of the many great bunny tutorials I’ve seen this past week. With Little Bit’s Easter basket to fill I figured these would be perfect. 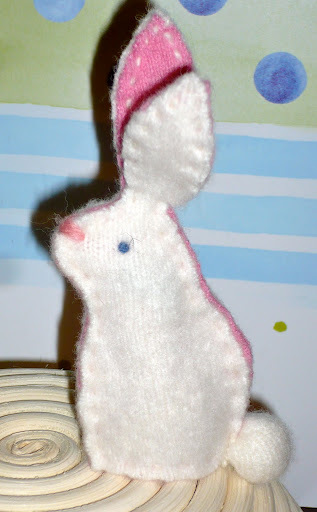 I found The Purl Bee’s finger puppet bunny tutorial through Lil Fish Studios. 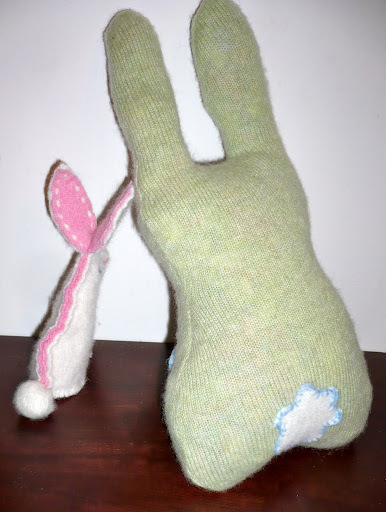 Lil Fish also used recycled wool for her bunnies! They work up really quick! I made this one this afternoon. He was made from leftover felted cashmere sweater scraps. I made a little cashmere scrap tail for him, instead of a pompom. I used wool yarn for the nose, eyes, and hand sewing the body. I didn’t change anything about the pattern, as it is perfect just the way it is! Tutorial 2 is one I just happened upon after seeing a different bunny that my cousin was making. I went to the site where she got her pattern and found this one by accident. It is called RevoluzZzionary Easter Bunny, but I just call it Lovey Bunny because of it’s heart. I worked on this one during 2 evenings. I changed a couple of things about this pattern to suit what I wanted it to look like. I added the ear and tail applique to give it a little something extra. I also changed the shape across the bottom. The pattern calls for it to be straight across, but as I was beginning to stitch up the bottom after stuffing I altered it to look a little more like feet. I used a wool yarn for the eyes, nose, and all the applique stitching. 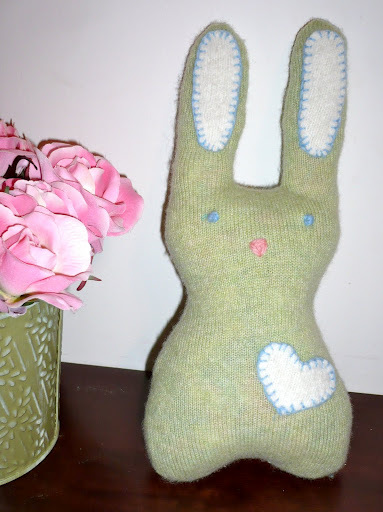 Lovey Bunny’s body and appliques are recycled cashmere sweaters! 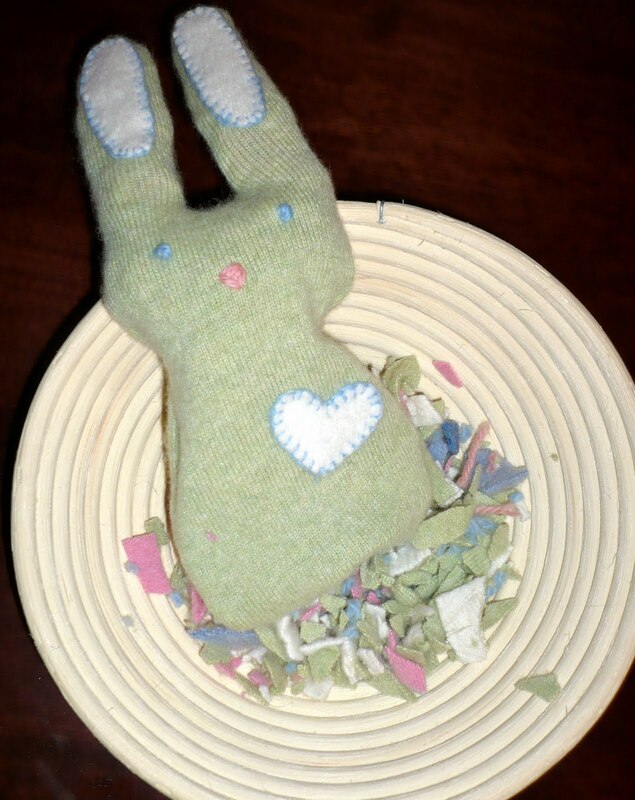 I used the really small left over scraps from cashmere sweaters and Wool yarn bits to stuff Lovey Bunny…. here he is getting stuffed. Here are a couple of more pictures of Puppet Bunny and Lovey Bunny contemplating their new existence and the thought of being loved by a 19 month old in a few days. I like to think they are practicing for hide-and-go-seek! 1, 2, 3, 4, 5, Here we come! 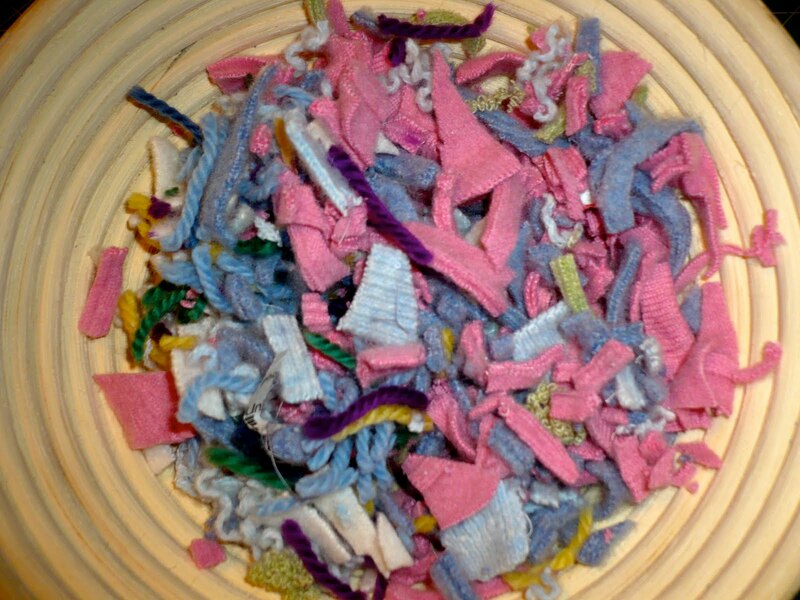 This entry was posted in cashmere, craft, fabric, hand sewing, holidays, Little Bit, Reclaimed, repurpose, reuse, sewing, sweater, toddler, Tutorial, up-cycle, wool, Yarn. Bookmark the permalink. Super cute and what a great reuse project! Plus I bet they're extra cuddly because of the cashmere. Awe, Thanks Lisa. 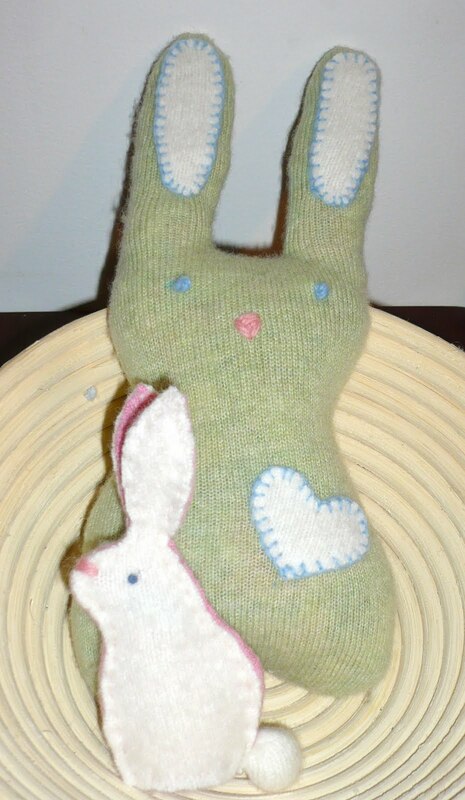 :) I specifically used the cashmere to make the plush one extra huggable!